Empedocles of Acragas is one of the most important presocratic philosophers, particularly because he is the first known author who speaks of what would become the traditional four elements: fire, earth, air, and water. He calls these the four ‘roots’, and they are eternally existing realities, far indeed from the modern concept of an ‘element’ in the chemical sense. These roots are affected by two eternal cosmic forces – Love and Strife – in a never-ending cycle of universal contraction and expansion over vast æons of time. Empedocles’ cosmic vision really will blow the top of your head off. He also has a compelling ethical position based in his theory of metempsychosis: human beings have a daimon – that is, a deity – which, like the soul in later thinkers, reincarnates into body after body. Since this is the case, eating meat or sacrificing animals are literally cannibalism and murder. We are all exiled gods, wandering through the elemental world and seeking to return to our original divine home among the high gods. It’s all pretty heady stuff. This episode discusses a few interesting facets of Empedocles’ thought, but can’t really do him justice in a half-hour slot. We do our best to whet your appetite for more, however, and hopefully lay down the basics of Empedocles’ theory of the four roots and why it is so important for later esotericism. Aristotle tells us that Empedocles is the first to posit the theory of four elements at Met. A4, 985a31–3. 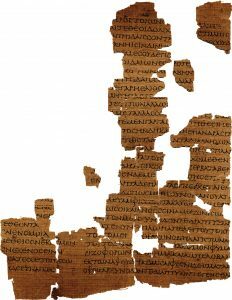 Diogenes Laertius, Lives of the Philosophers Book VIII, on the Pythagoreans, discusses Empedocles. Inwood, B., 1992. The Poem of Empedocles: A Text and Translation with an Introduction by Brad Inwood. University of Toronto Press, Toronto/Buffalo, NY/London. Cautionary note about understanding ‘philosophy’ and ‘religion’ as separate spheres, page 20.